A catering company and a restaurant. How good can it possible be is a legitimate question to ask. The answer is very good. Krua O.V near the Dusit Zoo dishes up some absolutely delicious bowls of authentic Thai Food with culinary roots in Central Thailand. You won’t find many westerners here, or young people for that sake. But you find quite a number of grannies occupying the tables. In other words, quality. Grannies doesn’t go to ordinary spots. They are picky and every meal shall be good. They don’t go for an industrial based plate or something halfway if they dont have to. I say; thanks to the grannies. And when you see numbers of them it means quality, it means home made food, it means great food and sometimes outstanding. They are great preservers of quality on your plate and in your bowls. Even if the food at Krua O.V. is rooted in the culinary traditions of Central Thailand, I wouldn’t protest to hefty if you add a pinch of south into it. But when sitting down, you don’t care to much about that. You just focus on the delicacies. I have tasted quite a few curries in my goal of eating my way through Bangkok, and most of them can be described as just plain or standard. Some even terrible, often to sweet or they lack depth. It’s a long list of pitfalls to stumble upon in the making of curries before you get to a great bowl. O.V avoids them all and pleases your taste buds. 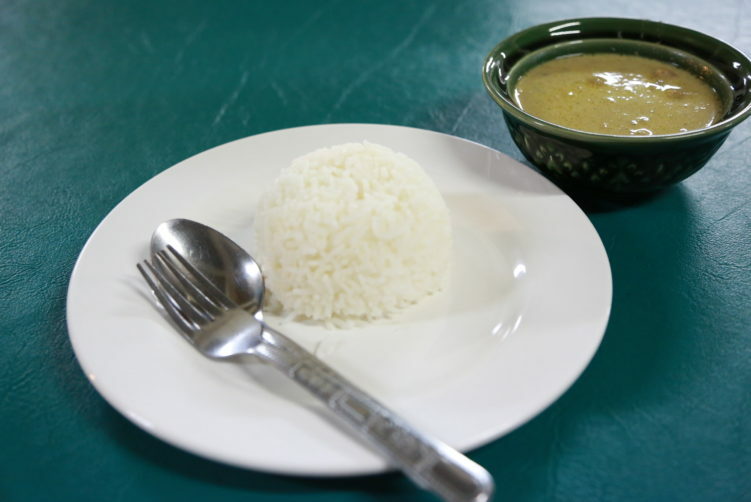 Initially I ordered their green curry with beef and a plate of rice, but I got quite excited after a chat with the owner that they served Kanom Jeen – rice noodles made of fermented rice. It is sometimes written Khanom Chin in the Thai language, and even if Chin means Chinese in Thai, it origins from the Mon people who inhabited the central part of Thailand before the Thai people arrived from south China. 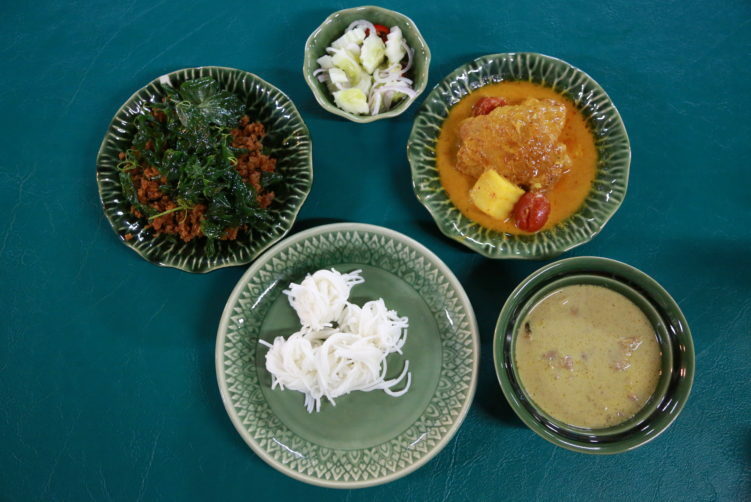 Sources like wikipedia indicate that Khanom Chin is derived from the Mon words Hanom Cin, meaning boiled noodles. Kanom Jeen is the normal way of writing it today. Kanom Jeen is actually quite a rare treat, even in Bangkok. 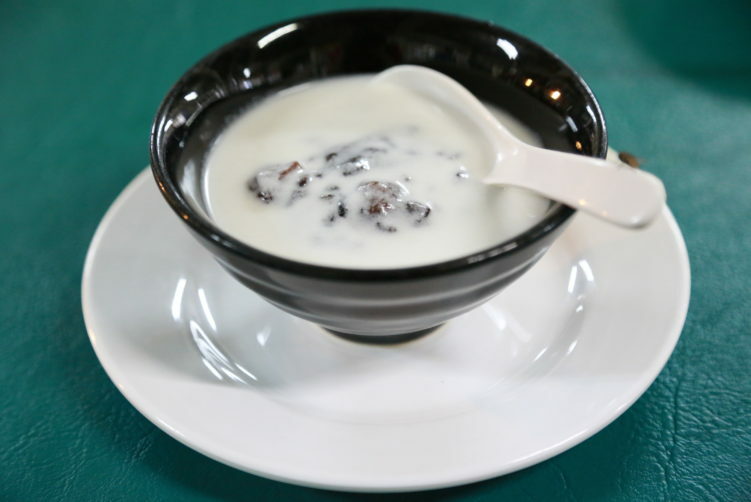 When you find it, it is served cold and most often with different kind of curries or noodles soups, especially if it includes coconut milk. Anyway, when noticing it, I extended my order to another curry, and on the owners recommendation, fried catfish. Fried catfish is by the way best with rice, especially the more spicier versions. My extension of dishes implied that I had to postpone three other restaurant visits that day, but i can assure you it was worth it. The green curry with beef was one of the best I have eaten. Full of taste, perfect creaminess, not to sweet and with a nice complexity from the spices. The beef curry have a certain spicyness added to it, but very elegantly incoporated witht the other spices. If you’re a newcomer to Thai food it might be a little spicy, but not more than you can handle unless you’re frightened of by anything spicier than black pepper. They also have a pork version of the green curry, but that will have to be for my next visit. While enjoying my green curry with beef the other dishes was quickly brought to the table. Most of the food is precooked so time isn’t really a matter here. But precooking is the essence of great curries as the spices integrate with the rest of the ingredients in a much better way than something cooked on the spot. It’s a reason why casserols etc. taste best after a day or two. The crispy catfish was good as well. Crunchy and slightly sweet, flavored with ginger and topped with fried basil. The Gaeng Garee Gai is nice and oily. The taste is rich from the coconut milk and slightly sweet but not overly so. The curry paste is rooted in a mix of Persian spices and the dish is topped with tomatoes. I wouldn’t disagree with those calling it a spicier version of the massaman curry. 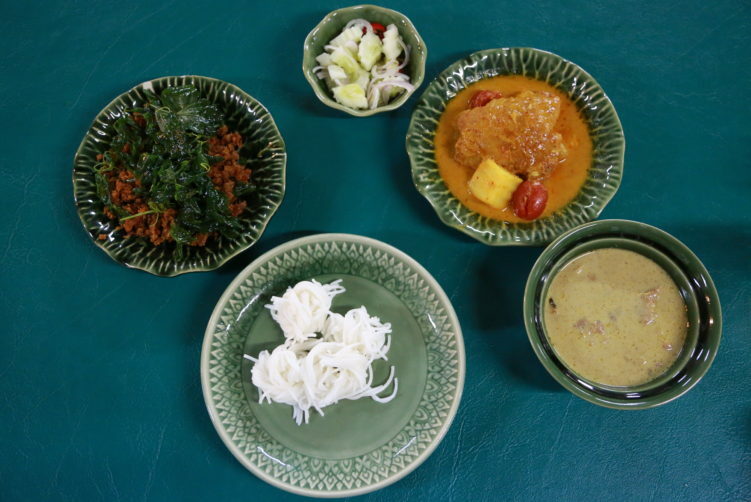 If you get here at summer time, you can have the excellent Royal menu (Khao Chae) to choose as well, consisting of rice and side dishes. That will have to be for another visit. Be aware that the spot do a lot of catering and can be quite empty outside lunch hours. click here Name: Krua O.V (also named OV Kitchen where O.V stands for Old Vajiravudh). trusted tablets Food: Central Thai Food. How to get there: Take the BTS to Victory Monument. From there, take a cab or bus to Thanon Pichai. You find Krua O.V between vajravudh college and Dusit Zoo. That is more prcecisely a short walk Nort of Zoo on Phichai road. 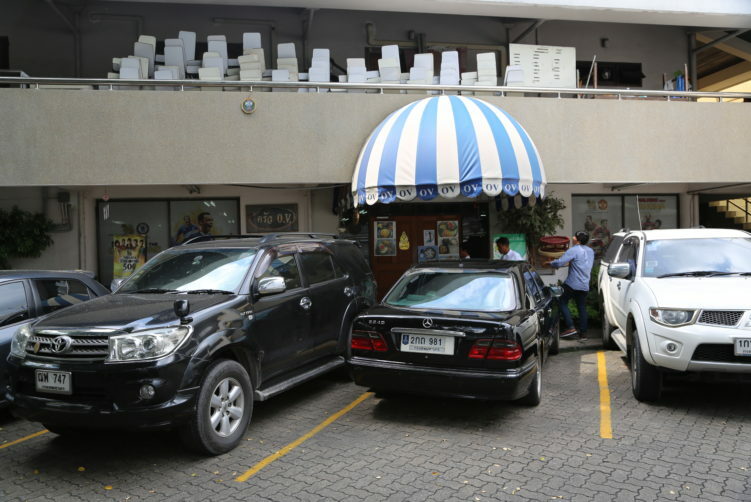 The restaurants itself is to be found in the Indra College Alumni Association. Make sure to take the right entrance. K rua O.V near the Dusit Zoo dishes up some absolutely delicious bowls of authentic Thai Food with culinary roots in Central Thailand. See full review at StreetsideBangkok.